At Atlanta Brain and Spine Care we utilize many tools to help diagnose and treat a patient’s spinal disorder. X-Rays are our most common method for diagnosing spinal conditions. Doctors are able to pinpoint areas of concern and make further recommendations in treatments. X-rays require no specific preparation, and a fraction of radiation is needed to produce quality film images. Doctors can pinpoint disorders, such as scoliosis or bone spur formation through the use of x-rays. Superior in imaging, MRI uses radio waves, computer software, and a magnetic field to take highly-detailed images or slices of the anatomy. The versatility of the MRI allows technicians to take angled shots of the spine, which makes identifying spinal pathologies easier for physicians. The imaging technique is radiation free. 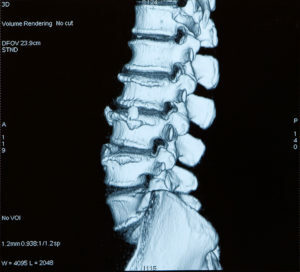 CT Scans are used for a more detailed look at the spinal cord or discs. CT or CAT Scans produce black, white, and grey or color images with detailed views of soft tissue, bone, and organs. CT Myelogram incorporates dye that allows the doctor to visibly see the spinal canal, cord, and nerve roots. Injected into the spine, the dye, or radiographic contrast media, illuminates parts of the spine that would otherwise be more difficult to view in a normal CT Scan. For more information on diagnostic testing, make an appointment with Atlanta Brain and Spine Care. Our expert surgeons will chart the best course of treatment for whatever condition you are suffering from. Fill out this form to get started.